When looking for a clean lines and bold geometric shapes with sophistication for a fresh and uncluttered look, the TOTO Connelly Suite is an ideal choice. The Connelly Undermount Lavatory measures 15″ by 15″ leaving plenty of space on the countertop. The deep basin reduces waters splashing, and its SanaGloss glaze saves homeowners time cleaning as the super-slippery surface repels bacteria and soap scum. It is available in Cotton, Colonial White, Sedona Beige, Bone, and Ebony. An example of TOTO’s inclusive design philosophy – providing ease of use for all ages – the sophisticated faucet’s lever handles serve as a graceful counterpoint to the vertically detailed, gently flared bases, which lends a tactile element to the fixture’s design. The spout has an organic curve that adds an elegant and soft design element to the sleek lever and base. The faucet has WaterSense technology and only uses 1.5 gallons per minute without a decrease in pressure. 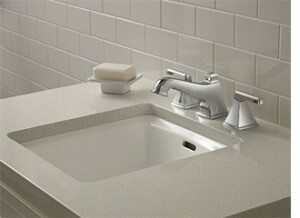 The faucet is available in an array of finishes including Brushed Nickel, Polished Nickel and Polished Chrome. 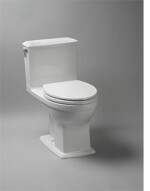 The Connelly Dual Flush High-Efficiency toilet is an elegant design with a strong geometric tank supporting a sizeable lid. The inclusive-design Connelly toilet is 17” from base to seat top, making it ergonomically correct height for a person to comfortably sit down and rise from it with ease. It is available in Cotton, Colonial White, Sedona Beige, Bone, and Ebony, with trip lever finishes available in Polished Chrome, Brushed Nickel, Polished Nickel, among others. The design specializes in its Dual-Max Cyclone Flushing system uses bio-mimicry to eliminate the need to scrub due to streaking after flushing. Inspired by cyclones in nature, TOTO engineers harnessed the power of gravity and water to spin away waste. To achieve their vision, they designed a seamless bowl interior with a concave rim to channel high-speed water jets for superior bowl and rim cleansing action. Each flush spins away debris, matter, and bacteria, which reduces the time needed to clean the unit. 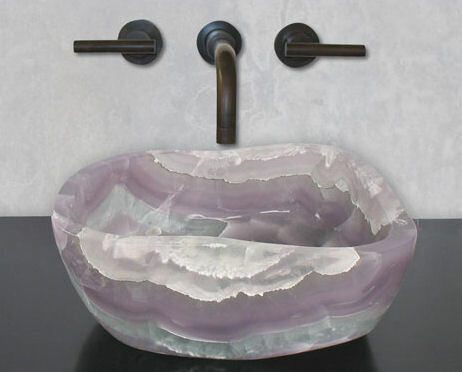 This Queen Stone Sink from Terra Acqua will make your bathroom the crowning jewel of your home. 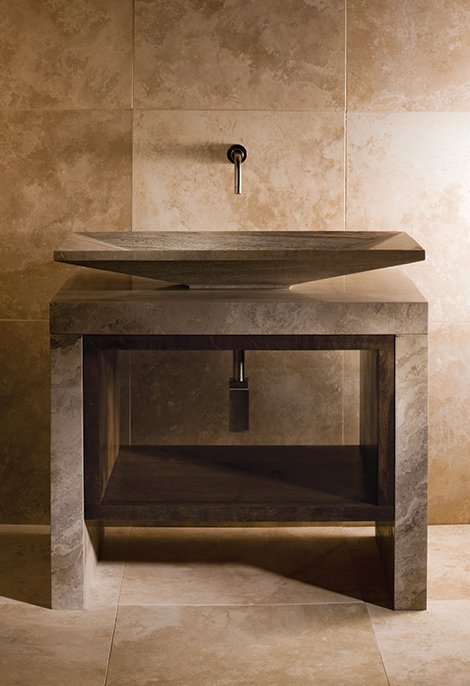 Cut from a single rock, each Miramar sink is unique in it’s shape and character. They average 4-5″ high and 13-18″ wide. Pricing begins at $1,195. 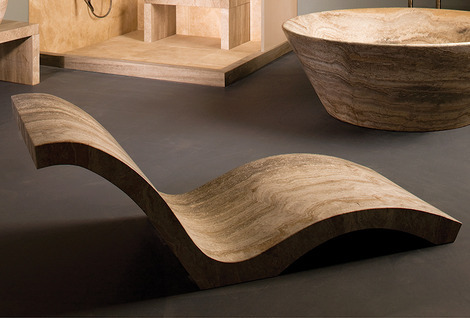 Terra Acqua offers vessels in the full Montecito Collection created from stones from around the globe. 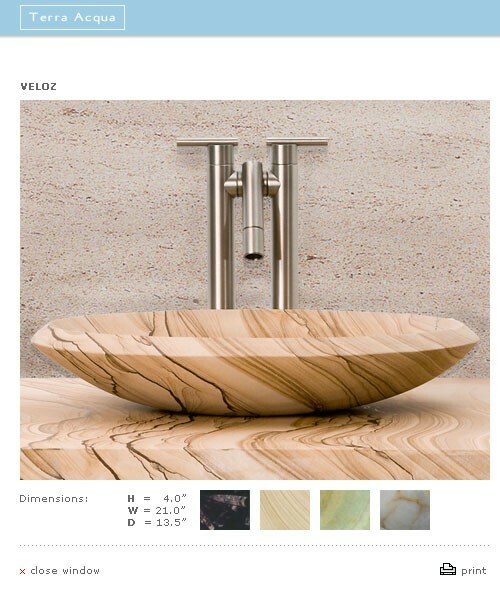 I really like their new Veloz vessel, shown in Sand Stone. I bet it is stunning in green onyx. 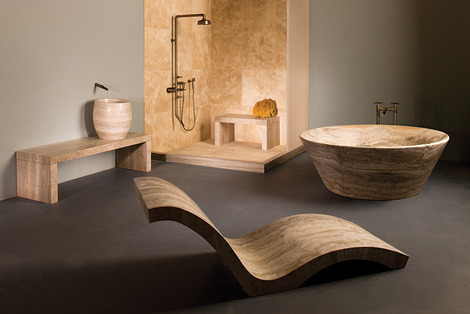 Stone Forest is know for sculpting Kitchen and Bath products from natural materials such as stone, bronze, copper and hardwoods. With their new Siena Collection coming out this summer, they will be offering a chaise lounge marking their first offering of a complete spa suite. The chaise is organic and curvy, designed to support the natural contours of the reclining body. It is a sculptural wonder that is likely to make you feel like a Goddess.The integrity of the Siena Silver-Grey Marble makes the carved chaise stand out discretely but powerful at the same time. 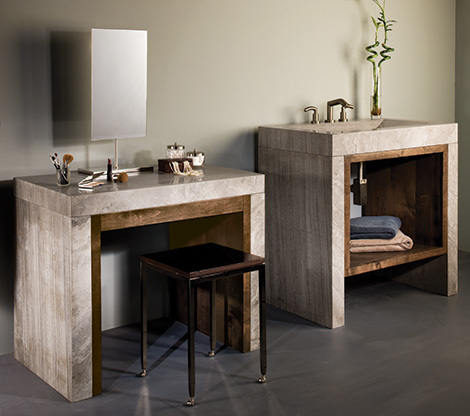 The Lastra Vanity and Recesso Console both feature an alder wood insert for contrast and shelving for storage. The Trucco make-up table has an alder drawer for discrete storage. The collection is completed with the Tamburio Vessel Sink, shown with the Banco Shower Bench, and the spacious 60″ Tazzo Bathtub. Note: The marble is more grey as shown in the picture with the make-up table and console vanity.